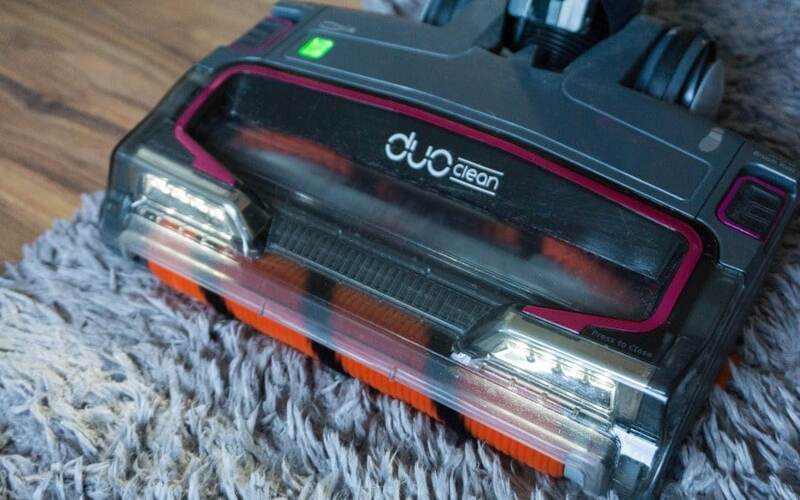 Shark DuoClean Cordless Vacuum Cleaner Review – Can It Handle Our Family? 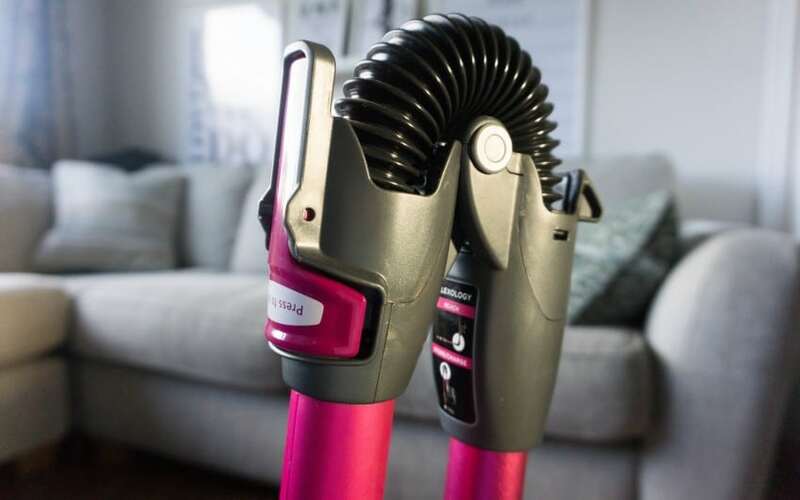 I’m sure you have seen the Shark cordless vacuum being advertised recently but would you like to know more about how it works in real life for a family of 5 with a dog? 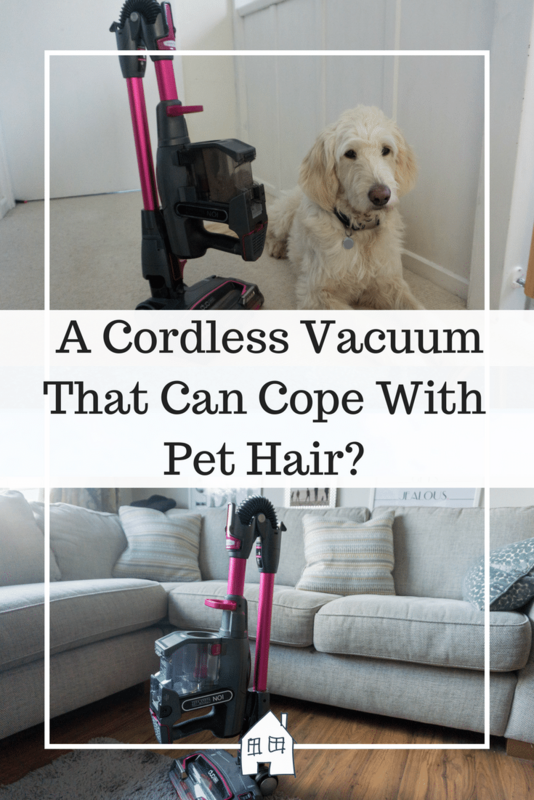 This is the model I have been reviewing over the past 5 weeks, there are many variations of Shark vacuums to choose from however Shark sent me this model to try out as I have a dog which does shred hair so need it needed to be able to handle dog hair too. 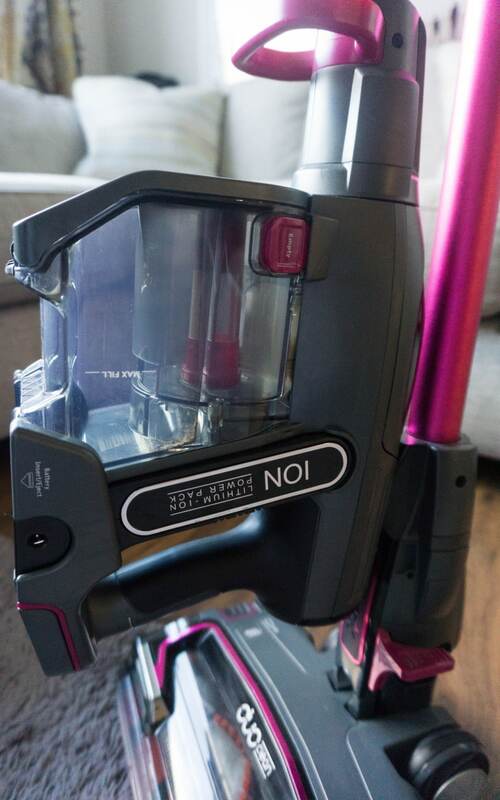 The Shark DuoClean Cordless Vacuum with Truepet comes in PINK! But yes it was really impressed, I loved how neatly it stood and at 4kg I was easy to carry around the house. All the different accessories came as standard, and I love that it was everything in one. I was looking forward to giving the house a good vacuum with it! The Shark cordless vacuum cleaner really stood out to me because of it being cordless. I have had a cordless vacuum for about 3 years now, and I couldn’t go back to a corded vacuum. I love being able to just turn it on and give the house, or just that room a quick vacuum without a big fuss. 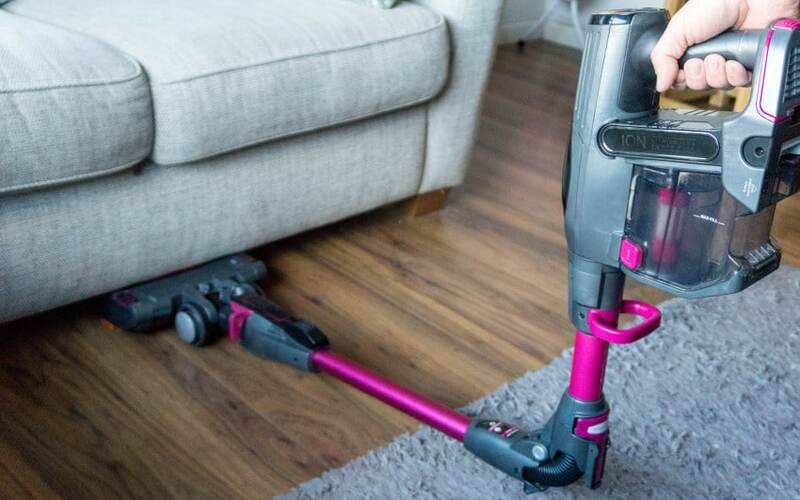 This is a really unique feature to the Shark cordless vacuum, it can ‘fold’ down to make a right angle, this allows the vacuum to bend and be pushed underneath furniture. After having back surgery I am very aware that I need to take care of my back now, and not bending incorrectly, so this sounded great! However we came across a problem, the advert showed it going under the sofa but ours is too low. Which is such a shame as my dogs hair always collect under here, but that isn’t Sharks fault. However it has so much flexibility on how you can use the Shark cordless vacuum. It pulls apart into so many versions, which I will chat more about them in this post. 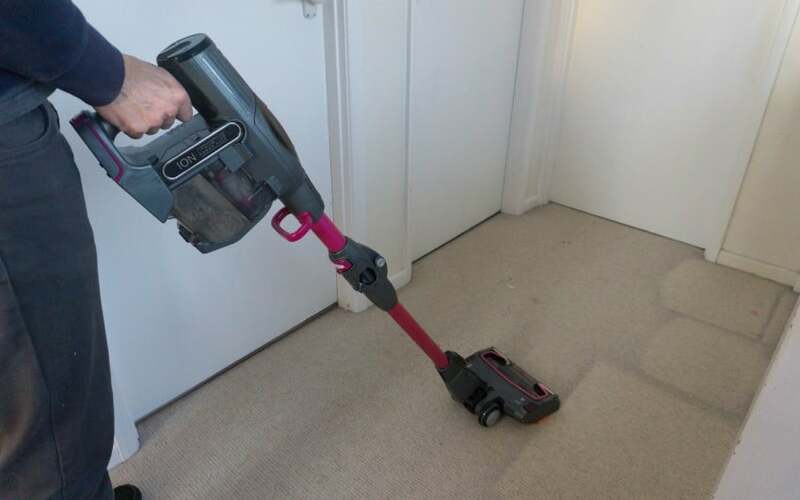 You have a handheld vacuum, push around vacuum, vacuum for high up places, for furniture, stairs and in the edges easily too. 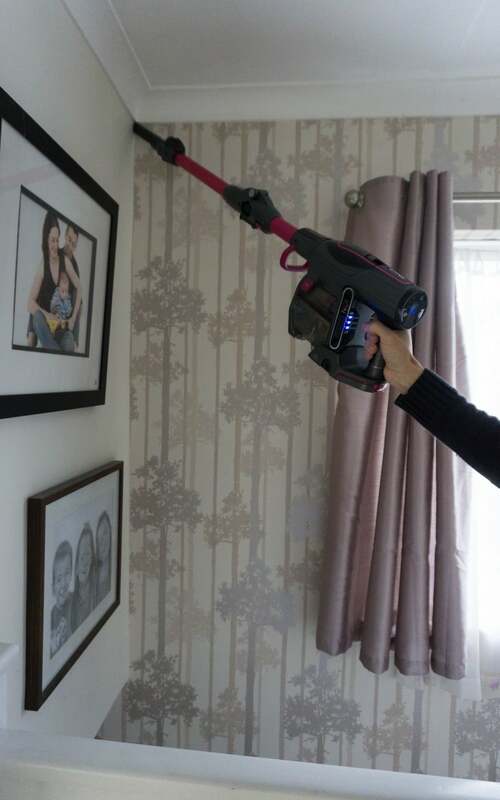 A great feature that I love from the Shark cordless vacuum is the convenience of it being a handheld all in one. 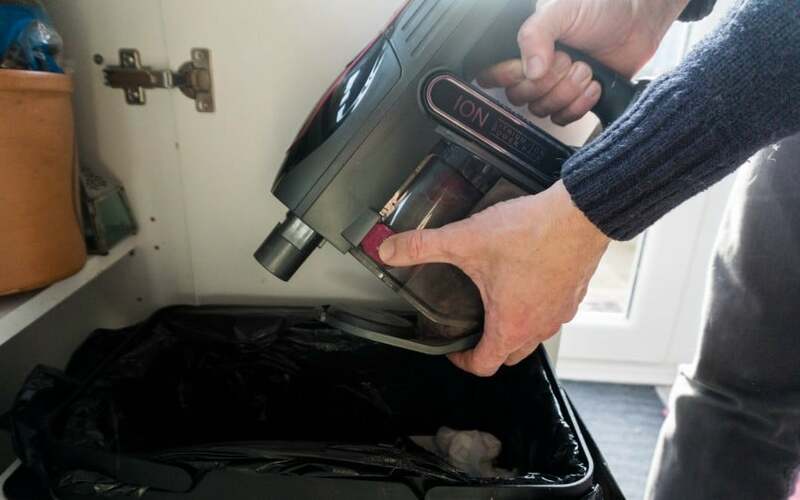 No separate vacuum for this, it just pulls apart and you can start using it straight away. 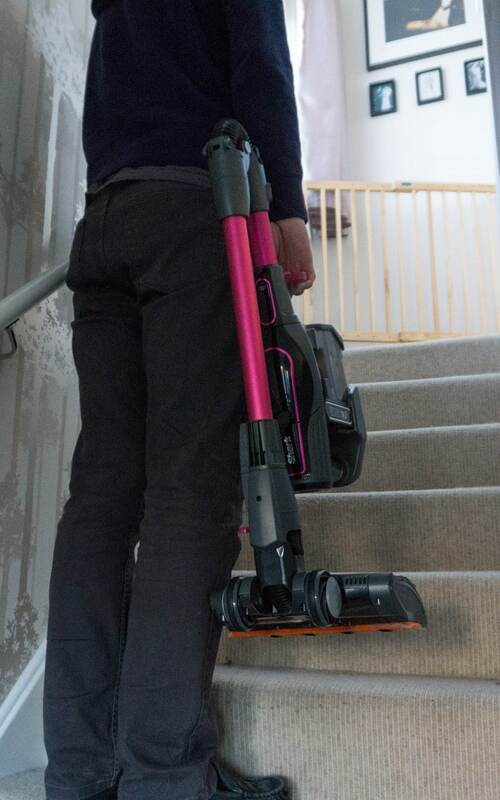 Using it to vacuum the stairs is really easy, same performance as the large vacuum, but small and easy to use. This could be used on furniture, or taken outside to use on the car. My kids also love going around using this one. You can add the different attachments on for what job you need. 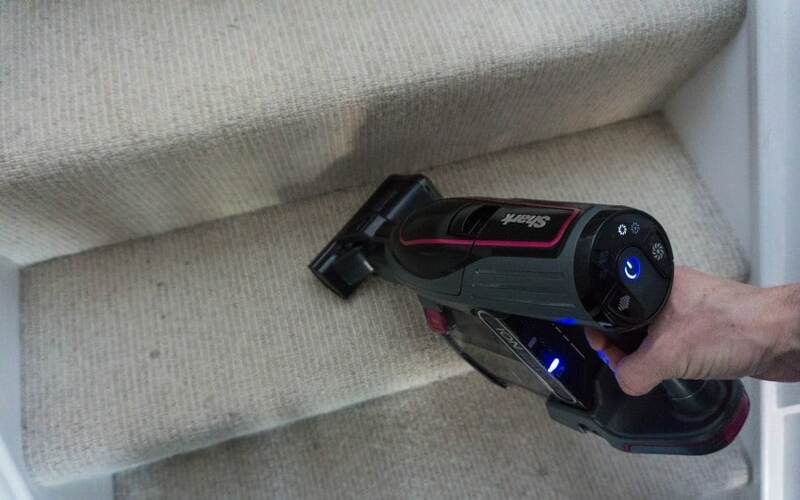 You can add the wand on to the end and vacuum over the stairs easily and in high places too. 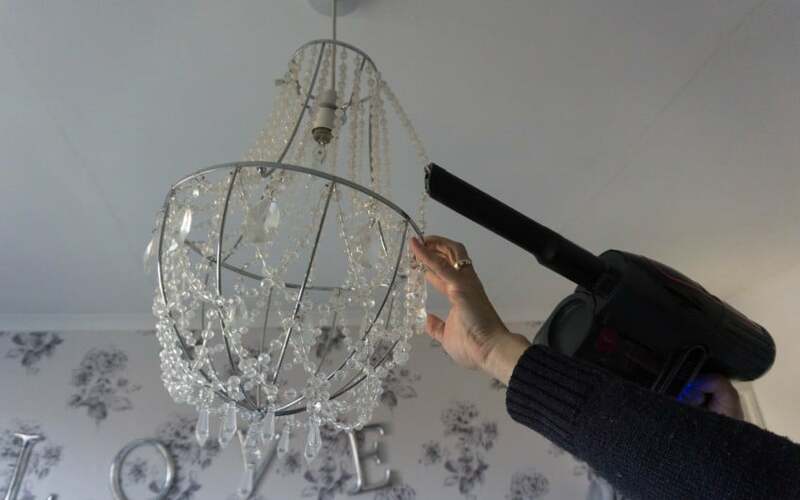 Makes the job so easy and don’t forget where it’s cordless you can just nip around all the rooms and get the job done quickly. Having own previous cordless vacuums I was really keen to see how powerful the Shark cordless vacuum was. Being powered by battery does it have enough power to get dirt from the carpets, rugs and around the edges? Well it did indeed! If you watch my video review you will see we put down a large pile of dog hair to show you how much it pulls in the hair from a distance! This is helpful as it cannot fit under the sofa properly, but it is strong enough to pull the hair that is trapped under there! 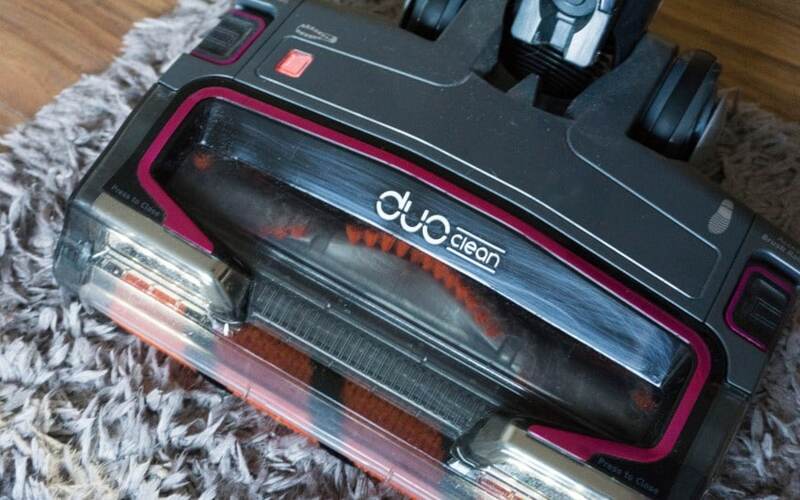 This is powered by the DuoClean technology, with two unique rollers that work together. You can see the orange front brush that pulls in the dirt and then the second brush drags it in. This is where all the hair gets wrapped around! Which does have a handy gap to run the scissors along to cut it all out quickly. It also means that you can easily switch from hard floors to carpets without switching heads. There is a button on the top section to control this too. Although I have found it struggles on my long pile rug when I have it on carpet selection, but fine on hard floor selection and still brings the rug up well. I was so impressed by how strong the suction was, how it handled vacuum on both hard floors and carpets. 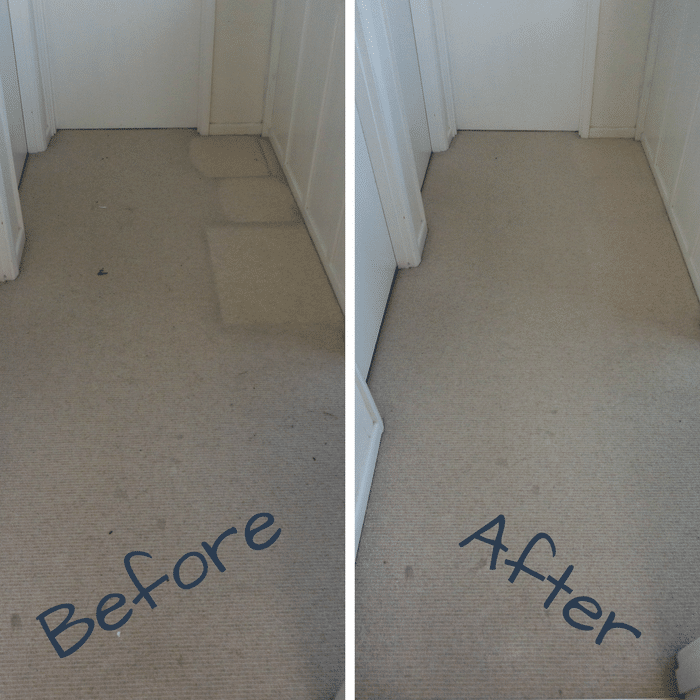 We have carpets upstairs and hard floors downstairs, so it has been put to work on both well. Here is the long pile rug, I did have to use the hard floor mode on it as when I used the carpet mode it did stop using the rollers. I love that it alerts you to this by having a green light when they are rolling fine, but red when they have jammed up. Your also spot the little head lights on the front too! 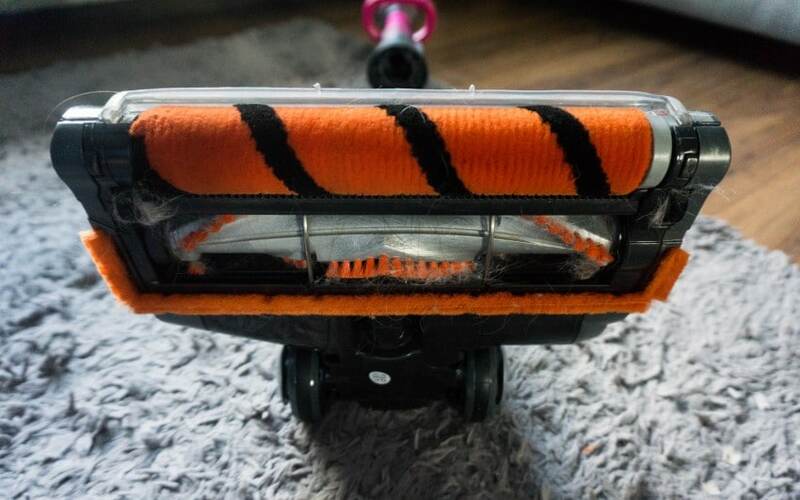 Nifty feature when vacuuming under the furniture, but also shows up the dirt much better when vacuuming. So how did the rug come up? This isn’t a picture of the first time, but the first time I used the Shark cordless vacuum on this rug we filled up the whole container with dog hair!! That’s how much better it is compared to my previous vacuum. How did it cope on the carpet? Please don’t judge me on the dust around the laundry baskets…..but it gives you a good comparison! This was a quick vacuum too and the dots at the bottom are probably toothpaste stains where the kids walk around with the toothbrush…..grrr!! Does It Cope With The Dog Hair? Yes it really did cope with the dog hair, our dog shreds hair quite a bit and it ends up in clumps of it around the edges so it has to vacuum up quite a bit when you come across it. It coped so well, it gets wrapped around the rollers and stuck in the container that has to be pulled out. However it picks up the hair very well and this is what you want. This Shark cordless vacuum model comes with one battery and a plug to charge it up from. This can be removed to charge anywhere, or the cable is long enough to place the vacuum next to the plug socket and charge directly. The battery takes approx 3.5hrs to fully charge, and this will give you a run time of 22 minutes. I have found this to be true. 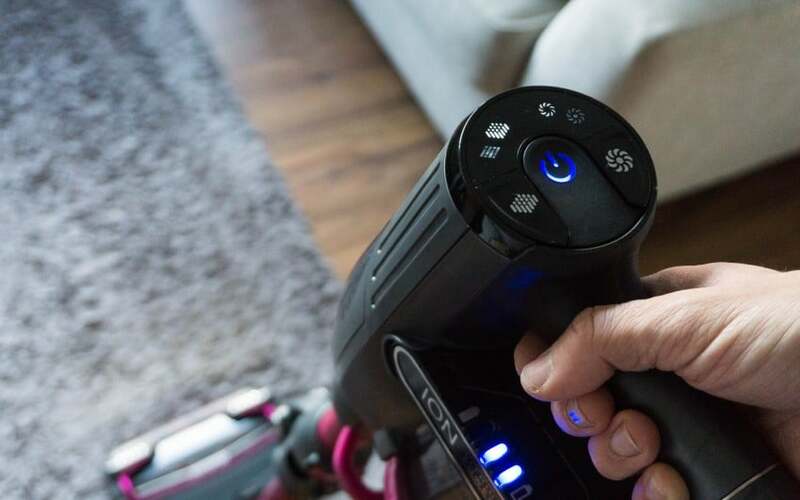 Although be aware there is another mode on the vacuum which can give you extra power so this would run out quicker. If your good and remember to charge it up regularly I think one battery is fine, however I have had a couple of times when it has run out on me whilst using it. Which is really frustrating, but by purchasing another battery you would have one charging whist using one. Shark does the next model up which includes 2 batteries and a dual battery charging dock. With the Flexology the Shark cordless vacuum can be stored anywhere, it is unable to be stored open and out straight as it is too top heavy. It stays in its folded mode which stands about knee height and can very sturdy. You could position it to charge it by a plug socket if you didn’t want to remove the battery. It is light enough to carry up the stairs easily by a little handle on the front too. All the accessories come in a shark cotton carry bag too ready to hang up and store. What is really good too is that Shark are offering a 5 years warranty and 2 years for the battery. Standard warranty’s are only 1 year, so make sure you get yours registered for the 5 years warranty on yours. They must be pretty confident about the quality of their vacuums! 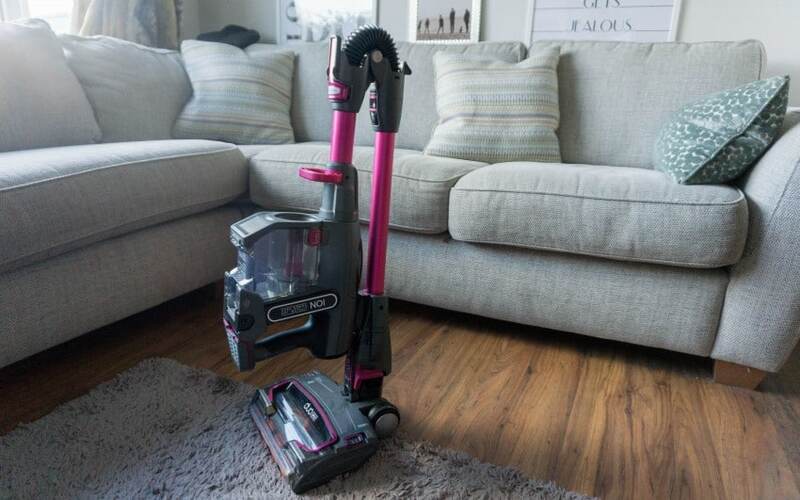 This model is priced with a rrp of £379.99 however it has been on offer for £279.99 and on Amazon currently at £269.99 and I think for a cordless vacuum with a handheld option too it is well worth it. With great performance and flexibility I think it well priced. The only thing we have found it’s not a ‘clean’ job to clean it out. The dog hair does get caught in the container when you are emptying it, so you can’t just open the door and let it drop into the bin. You do have to pop your fingers in and grab the hair to empty fully. But that is it! I love this Shark cordless vacuum and will be happily vacuuming my home now with no troubles. Please do take a look at my video review if you want to see it in action! 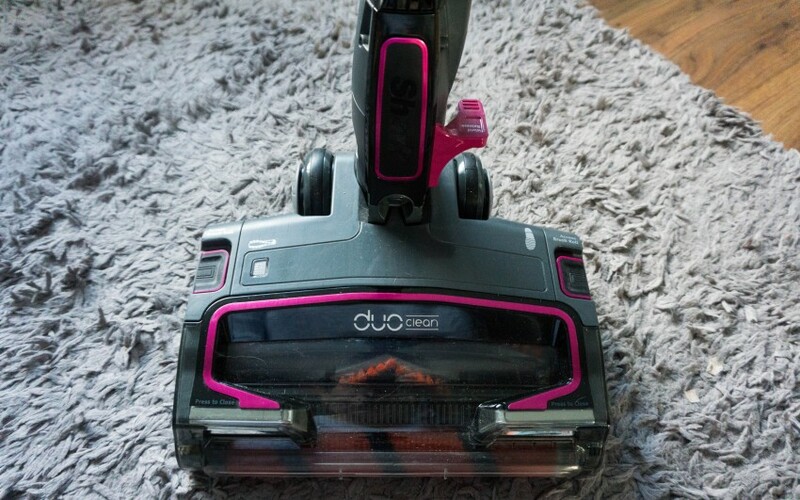 *I was sent the Shark DuoClean Cordless Vacuum Cleaner with TruePet and Flexology IF200UKT for the purpose of this review. However all opinions are honest and of my own. Post contains affiliate links, which means I get a small commission, but you don’t pay any extra. That certainly looks a lot more flexible than mine. Hoovering is a full on workout in this house!! There are bonuses to that though…getting fit at the same time!! However I am all for ease!! A great design and looking vacuum. I love that it helps you get all the dust under the sofas. I’m a wheelchair-user and always looking for a handheld dust-buster thing. I might look into this one! That’s the most flexible vacuum cleaner I’ve ever seen. Very handy. I love my cordless vacuum. I don’t think I could go back to having to plug it in. This one looks great. I couldn’t go back either, such a pain with a corded one! I can see a clear difference in the before and after photos. Lovely gadget. What a funky looking vacuum and I love the colour! It gave an impressive result on your rug. This does look impressive, especially the first before and after picture really shows off what it can do. Our house is on 3 floors and it could definitely do with one of these. Wow, I never know it has so many other tools! I so love how it really clean up the mess and especially the dirt and hairs. Now I am thinking of buying this for my own home or as a gift for mommy! 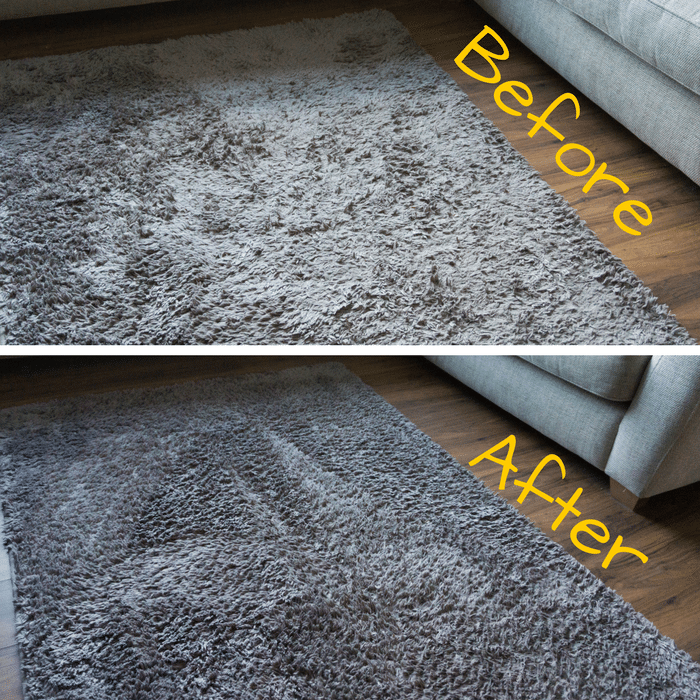 Wow, your rug looks amazing after! I love that it can get under sofas easily too. That’s my big bug bear. Oh that just looks amazing. So helpful being able to get in all the hard to reach places. Wow this looks great!! I do love our hoover but I so wish we had a cordless one for the stairs! 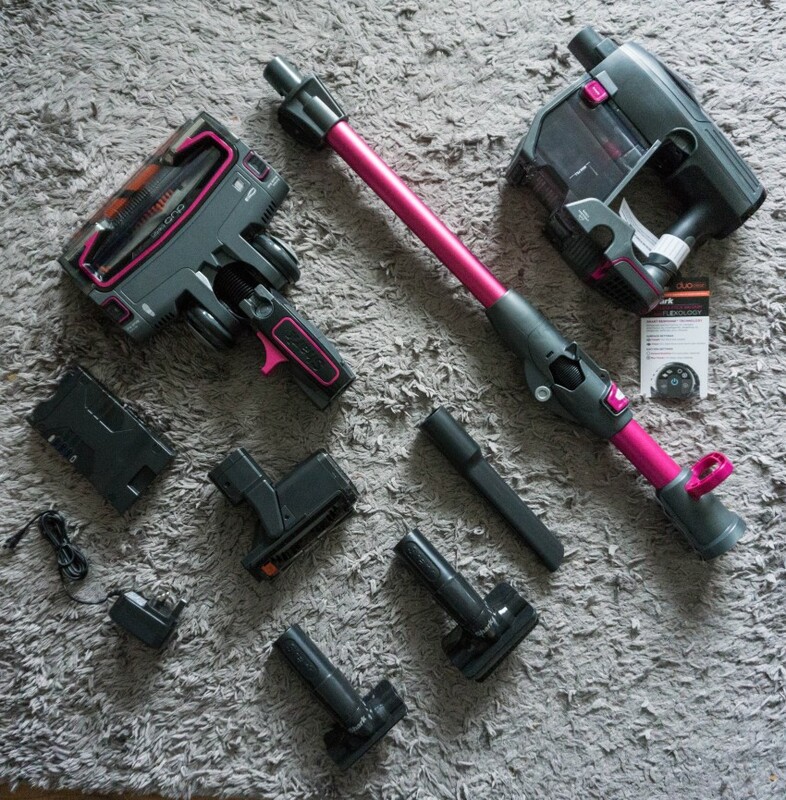 Cordless is the way I need to go as I’m still lugging the hoover around everywhere and replugging it in…not easy process in our home! This one looks really great 🙂 Wonder if it could cope with all our mess from the fire! What a great vacuum cleaner. I love how it changes for different usages. I hate having to tug mine upstairs, it is so heavy. This looks like such a good hoover and so easy to carry around and get under furniture. 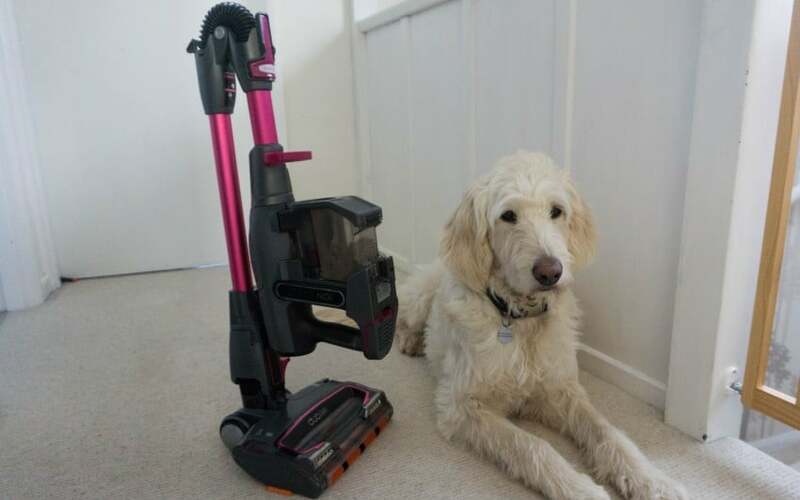 Our hoover is slowly dying, so we have been starting to look into buying a new one. 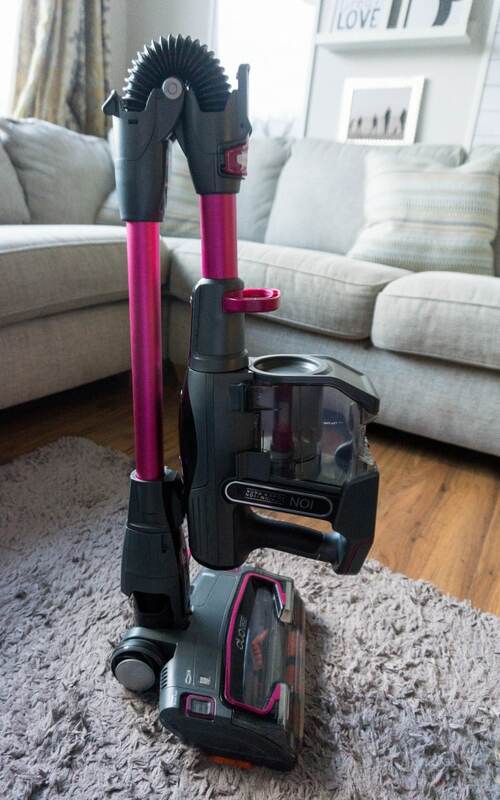 Home » Home and Interiors » Shark DuoClean Cordless Vacuum Cleaner Review – Can It Handle Our Family?